Starting from Friday, South Korea braced itself for one of the biggest annual movements of people nationwide as many head to their hometowns for Lunar New Year celebrations next week. According to the Ministry of Land, Infrastructure and Transport, some 49 million people are expected to hit the road during the holiday that lasts until Wednesday. Traveling from Busan to Seoul by car, for example, would take more than eight hours when people head home on Tuesday afternoon. For example, SK Telecom predicted that roads would be most crowded at noon Tuesday. Kakao said the number of travelers would be the highest Friday between 3 p.m. and 7 p.m. and Tuesday between 5 a.m. and 3 p.m. If drivers in Seoul begin their journey at noon on Tuesday, it would take up to nine hours to arrive at Busan, SK Telecom said. It would take up to more than six hours to travel between Seoul and Gwangju. According to Kakao, the most ideal timeframe for traveling is between 7:30 p.m. to 9 p.m. Monday. 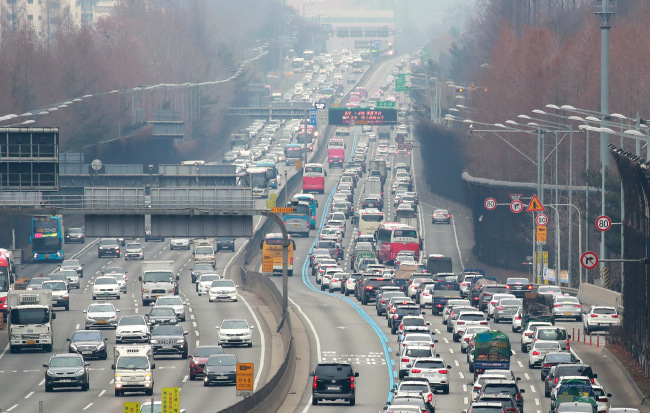 If drivers leave Seoul at 7:30 p.m., it would take less than five hours to reach Busan. A trip between Seoul and Gwangju would take only about four hours, the company said.